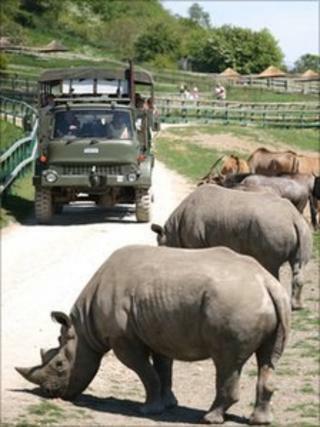 A Kent animal park is set to undergo a £1m upgrade which will see its African exhibit expanded. The project at Port Lympne Wild Animal Park involves changes to its African Experience, which was launched in 2005. It will increase its safari area from 100 acres to 500, and cut the area to explore on foot from 500 to 100 acres. The "on foot" areas of the park will be divided into four zones where visitors will be able to explore exhibits and interactive educational displays. Managing director Bob O'Connor said the new format would overcome the problems experienced by visitors "struggling to see and do everything on offer". "The new format will not only overcome the problems of scale and topography but will allow visitors to embark on a unique adventure, getting up close to iconic wildlife while learning about the threats they face. "We are hoping that this experience will put Port Lympne on the map as the must-see conservation attraction in the UK."